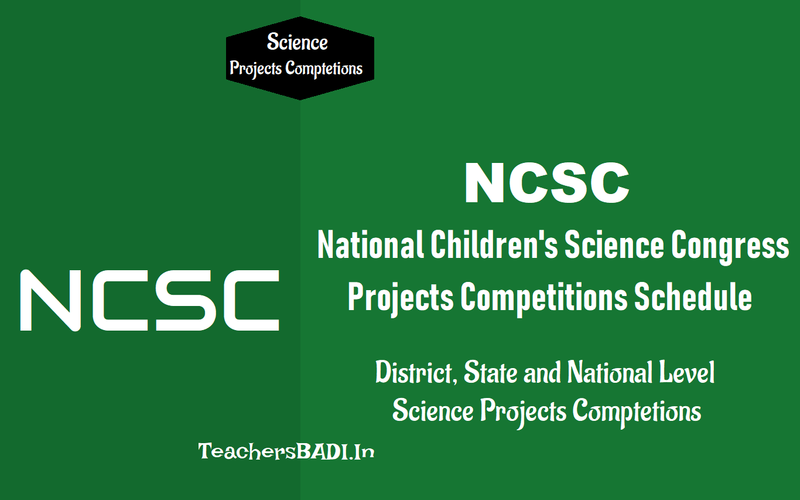 National Children’s Science Congress (NCSC) 2018-2019 : #NCSC 2018-2019 will be conducted in District Level, State Lavel and Natioanal Level. NCSC is a programme of National Council for Science and Technology Communication(NCSTC), Department of Science and Technology, Government of India. NCSC main aim is an ideal and innovative programme for children to inspire, empower and exapand both their mind and word. Post-independence India has seen quite a few marvelous science & technology interventions for emancipation of peoples’ life in all its facets. Scanning through the truly national efforts in the last couple of decades, one event that readily comes to mind is National Children’s Science Congress (NCSC), which not only has changed the way we look at science; but also has ignited the minds of Indian children, because it directly involves these budding citizens of our vast country. But the best part of this movement is the involvement of the adults too; be it as motivators and guides, or organizers and facilitators. Such an amalgamation of diverse people and thoughts has truly made National Children’s Science Congress an extremely popular and desirable activity in the Indian scientific calendar. "Science,Technology & Innovation for a Clean ,Green & Healthy Nation. 1. Ecosystem and Eco system Services. 2. Health , Hygiene and Sanitation. 4. Society, Culture and Lovely hoods. 5. Traditional Knowledge Systems (TKS). All MEOs, HMs of Govt & Z P. Schools, SOs of KGBVS, Principals of Model Schools & Correspondents of private schools are here by informed to prepare projects for NCSC-2018 Compititions. District Level Children Science Congress will be held in the Third week of October-2018. Actual Date and venue communicated shortly. Further details contact on 9849598281(DSO), 9866549297(NCSC Coordinator), 9440849587(NCSC academic coordinator). 1. Selection of subjects for activity and registration of teams : On Going! 5. National Level Congress : National Children's Science Congress in December. 1. అక్టోబరులో "జిల్లా స్థాయి బాలల సైన్స్ కాంగ్రెస్"
2. నవంబరు చివర్లో "రాష్ట్రస్థాయి బాలల కాంగ్రెస్"
3. డిసెంబరులో "జాతీయస్థాయి బాలల కాంగ్రెస్"
4. చివరగా 2019 మార్చి లో "ఇండియన్ కాంగ్రెస్"
To encourage children throughout the country to visualise future of the nation and help building generation of sensitive, responsible citizens; To stimulate scientific temperament and learning the scientific methodology for observation, collection of data, experiment analysis arriving at conclusions and presenting the findings. The NCSC has a centrally decided scientific theme, socially relevant and modern and expects children in the age group of 10 to 17 years to form a small group under a guide teacher in his school, select a sub theme from the main theme, develop a hypothesis, design experiments, collect data, organise and analyse it before reaching on conclusion. The GOI expect students to develop traits of working in a team, be able to appreciate that science is for society and acquire knowledge of method of science. Children’s Science Congress is a celebration of practical science. It is an inclusive platform where young scientists use their scientific skills to address real problems. The challenge begins from selecting the issue, analysing and examining it, suggesting solutions, working on a likely path. You develop science communication skills also as you are required to present the work and results before peers and experts. An important skill that you improve is statistical methods and pattern recognition. This is to be attempted in as rigorous way as possible with significant sample size and accurate data collection. Both these facets will be useful in your adult career – as a scientist or any other professional. This year focal theme is "Understanding Weather and Climate". the very important and socially relevant current research issue world ever. Competition and recognition of merit is introduced at district, state and national level. National level congress is due on December 27-31, 2014 at Bangalore. A unique program that motivates children to take-up scientific research on local specific issues of their choice under broad themes, instead of imposing issues on them. A real experiment to promote ‘methods of science’ with ample opportunities to encourage creativity, innovation and experiential learning(learning by doing). An activity towards promoting spirit of team work, correlating science with everyday life situations. A potentially strong and effective movement for influencing the impressionable minds to enhance community feelings and sensitize towards societal needs. An event not merely for the privileged and school-going children; but even for those who are not in the formal school set-up, drop-outs, or forced to be out of the conventional mode due to poverty and disabilities. The National Children’s Science Congress (NCSC) began as an experiment in Gwalior, Madhya Pradesh in the early nineties, involving children in open-ended scientific projects of relevance to the society. It became a nationwide activity since 1993. The Congress is organized by NCSTC-Network, a registered society. In a brain storming session with all like minded organizations & individuals associated with NCSC declare a Focal Theme, with relevant sub-themes, for every two years. Necessary Activity Guide, leaflets, application forms are circulated well on time through the State and District coordinating agencies. District level organizing committees and academic committees are responsible for disseminating the message and software to the children spread over the length and breadth of the country. Children form groups of 2 to 5, and select a guide to steer them through the project. They first identify a topic/ an issue/ a local problem under the given sub-themes and make quick assessment of the work schedule. Projects build up on models, prototypes or hypotheses which might be very refreshing and innovative; some of them based on surveys conducted by children. Working through surveys, collection of data, collation of data, drawing results, representing findings by suitable mathematical tools, suggesting solutions, testing results in the field, concluding with follow-up actions in that order, the groups prepare the project reports in a standard and uniform manner. The report is presented first in the District Level Congress by the group leader and is assessed by a group of evaluators. All selected projects from this level are next presented in the State Level Congress in front of a wider audience and discussed threadbare by all concerned before they are sent for the grand finale National Level Congress, held during 27 - 31 December every year. Seven to eight lakh Young Scientists participate at various levels from the states & union territories. Two-three best projects from each state also participate in the annual session of Science Congress organized by Indian Science Congress Association, every year during January 3rd - 7th. The primary objectives of the National Children’s Science Congress is to make a forum available to children of the age-group of 10-17 years, both from formal school system as well as from out of school, to exhibit their creativity and innovativeness and more particularly their ability to solve a societal problem experienced locally using the method-of-science. By implication, the CSC prompts children to think of some significant societal problem, ponder over its causes and subsequently try and solve the same using the scientific process. This involves close and keen observation, raising pertinent questions, building models, predicting solutions on the basis of a model, trying out various possible alternatives and arriving at an optimum solution using experimentation, field work, research and innovative ideas. The Children’s Science Congress encourages a sense of discovery. It emboldens the participants to question many aspects of our progress and development and express their findings in vernacular. Who are eligible to participate? Any children within the age bracket of 10 and 17 years can participate in NCSC, irrespective of caste, creed, religion, language and ethnic background. 10 to 14 years constitutes the lower age group; while 14+ to 17 years is called the upper age group. The age is calculated on the basis of attainment on 31 December of the calendar year. NCSC is not necessarily a school-based program; it is open to all nonformal systems of education besides out-of-school and disabled children. Children in the past have joined CSC from science centers, clubs and other forums also, although they are also part of school systems. In which Area One Should Do the Research/Project? Every year a focal theme is announced for the NCSC. The children are expected to carry out projects related to the focal theme and the identified subthemes. Activity guide books are available to help guide teachers and the scientists. A group of children not exceeding five can do the project with the help of scientists, school science teachers, coordinators of school science clubs, activists of science based voluntary organizations, etc. The teachers/guides receive special orientation on the theme of the NCSC every year. The best potential projects are further screened at national event by a team of evaluators. Short listed potential projects & Children involved with those projects will be given the opportunity to pursue their study in some of the designated laboratories for a specific period. About 8 - 9 lakhs children participate every year in CSC starting from district level since 1993. It welcomes international participation and sharing of experience. It has records of international participation from countries like Germany, Srilanka, Bangladesh and ASEAN Countries. Hospitals in India have team of doctors that check each and every case jointly and decide the best line of treatment suitable for the patient. Since the treatment of cancer requires a lot of physical and emotional strain. this site is very bad. I had been trying to copy the imp points, but i cant this sites text is not even selective. i had joined science congress and I am lokking for the topics but still itz not there?????????? Know the best hospitals in India where you will find advanced treatment facilities & services. Get free guidance/information for any disease & its treatment. please give result of ncsc 2016 at district level. it may be not complete. so complete it by giving reasult.